The CS692 2-Port USB USB HD Video/Audio KVM Switch from ATEN links two HDMI enabled PCs or devices to a single USB keyboard, USB mouse, and HDMI display. 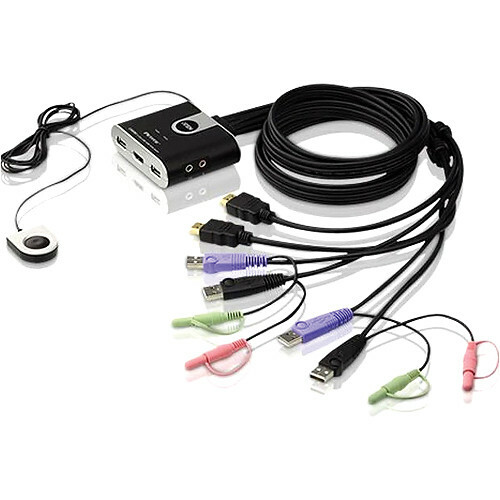 The CS692 switch offers HDMI functionality, USB 2.0 peripheral sharing, and 2.1 surround audio. The remote port selector allows you to control port switching from your desktop while the switch is stored away allowing for a more organized workspace. The switch's DynaSync™ technology, various compatible keyboards and mice, along with the other features are designed to enhance user-friendly operations. Box Dimensions (LxWxH) 9.2 x 6.5 x 3.0"